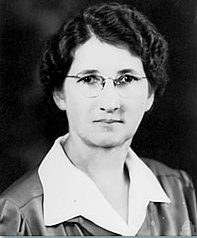 Jessie Eudora Campbell was born in Lincolnton, North Carolina, on Feb. 10, 1891 to Sarah Jane Beal and Andrew Leeander (later shortened to Lee) Campbell. She had three brothers, Luther, Clarence and William; and two sisters, Louella (Lula) and Nora. Jessie was self-educated. She had only finished second grade when she had to quit school to help her mother at home (the family kept boarders). Her father, Lee, had a good education and at one time had been a professor at an academy near Lincolnton. Jessie began work in a mill in Lincoln County when she was so young that she had to stand on a box to be tall enough to reach her work. She later told her daughter Polly stories about going to work in all kinds of weather and about boy friends who had to rent buggies to take them riding, or a horse to visit them. Lee went to Cliffside and got a job cutting meat for the market at the company store. In two weeks he returned to Lincolnton to take part of his family and their household belongings back to Cliffside by train. He left Jessie, Lula and Luther in Lincolnton because they had jobs. Jessie was only eight years old. When Lee and the family (Sarah, Clarence, William and Nora) got to Cliffside, their assigned house was not yet empty, so Cliffside people took the family in and cared for them until their belongings could be unloaded from the box car. Eventually Jessie, Lula and Luther rejoined the family in Cliffside. At some point Jessie began dating Timmons (Tim) Thomas Carpenter. Although Jessie never talked very much about her years when she was dating Tim, her sister Lula told Jessie’s daughters stories of all the parties and dances they went to in a group. Jessie married Tim on September 17, 1916. 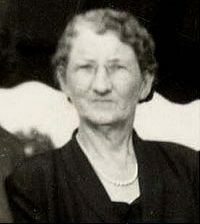 They lived with Tim’s mother, Hester Wall Carpenter. Both Tim and Jessie worked in the mill. In 1917 their first child, Daisy, was born. Polly was born in 1921 at the Campbell house. Her father (Tim) didn’t come around until 48 hours later. He brought Grandmother Carpenter with him, and after a brief visit took four-year-old Daisy home with them. They kept the child for four months, and only brought her home when she got sick. When Polly was about nine months old, Jessie moved the three of them into three rooms in a neighbor’s house. Tim, still living with his mother, didn’t help with any support at all. A dozen years later, he would finally obtain a divorce. Eventually the little family moved into half of a small two-family home on West 1st Avenue, located behind Jessie’s parents’ home, where Jessie lived out her working years. In the beginning, Jessie had only one pot lid to cover whatever was cooked. Friends and neighbors helped feed them. Several widowers would bring flowers, rabbits, vegetables, fresh meat and other goods and leave them on the door step. Jessie had a green thumb and tended a vegetable and flower garden. On the 1935 list of houses, her neighbors on the little street were the families of Hoyle Lovelace, B.F. (Pick) Biggerstaff, and Fred Greene (married to Nora Campbell, Jessie’s sister). She never complained about all the hard work and hard times, even when Polly began having asthma attacks at age two. Jesse and her mother, Sarah Campbell, would rock Polly and try lots of old folk remedies, such as burying a dish rag, and cutting a stick to Polly’s height, with the idea that she would be well when she grew taller than the stick. Jessie valued education highly and made sure that both her daughters graduated from high school. Many years later Polly recalled the year that Daisy graduated from high school and she, polly, graduated from seventh grade. Her mother was bringing home only $2.98 a week for three days work. Those were very tough times; the family could not even afford electricity. Jessie lived a quiet life, enjoying her friends and attending the Methodist church. She retired in the mid-1950s and divided her time living with Daisy’s family in Spindale and Polly’s in Cliffside. During the last ten years of her life, she lived at Edgewood Home in Forest City, and endured several amputations due to poor circulation. By the time of her death, both legs had been amputated up to her knees. But she had an indomitable spirit. 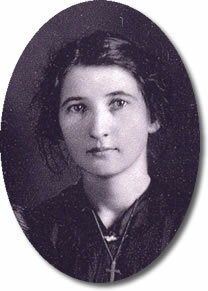 She never complained and was lucid almost to the day she died, at 93, on November 17, 1984. She was a very special lady. Her children, grand children and great grand children all adored her. For one who collected obituaries, her own was surprisingly brief. Information provided by Linda Webster Poteat and Judson O. Crow. 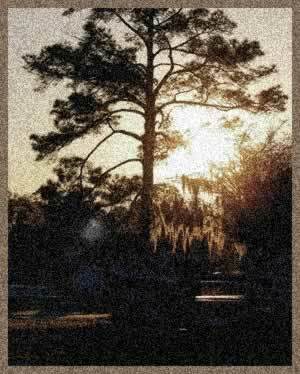 Photos courtesy Linda Poteat, grand daughter of Jessie Campbell Carpenter.